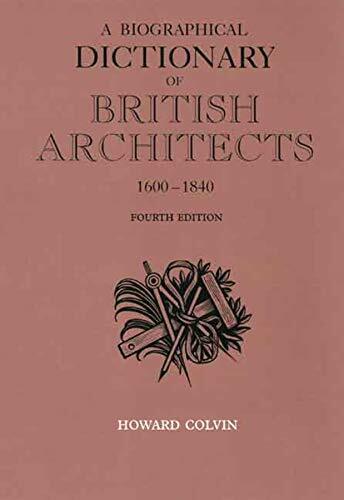 This authoritative and now classic work of reference on the history of British architecture contains biographical information on some 2,000 architects who practiced in England, Scotland, and Wales from the time of Inigo Jones (1573-1652) to that of William Burn (1789-1870) and Sir Charles Barry (1795-1860). This new edition is the fourth of what began in 1954 as A Biographical Dictionary of English Architects 1600-1840. It now includes 62 newly identified architects and about 700 additional building entries. The dictionary lists every building of importance whose architect can be identified, together with such details as dates of erection and demolition, style, and references to illustrations and published descriptions. Besides a concise biography of each architect, the book gives, whenever possible, a brief assessment of the quality of the architect's work. All architectural books published by British architects of the period are listed by author name.